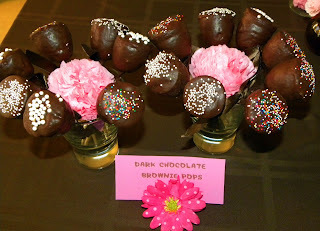 As promised, here are the recipes that made the chocolate sprinkle so chocolatey and delicious! 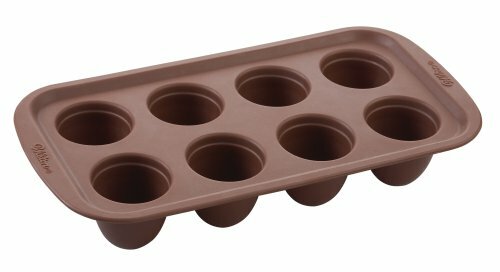 Prepare brownies and bake in the Wilton Brownie Mold....if you don't have one, you can use a mini muffin pan. You can definitely use your favorite brownie recipe from scratch, but I had so much to make I really didn't have time. Plus, I like Ghiardelli's brownie mix. After they come out of the oven, let them cool a bit and transfer to a wire rack. Stick in the lollipop sticks. Let the brownies cool completely! Melt the chocolate chips in a double boiler until smooth. Dip your pops! Stick into a Styrofoam block to dry. Wipe off any dripping chocolate. Tie sticks with a cute ribbon and you are done! I transferred mine still in the styro block, it worked well that way. This recipe is SO easy, and such a crowd pleaser! 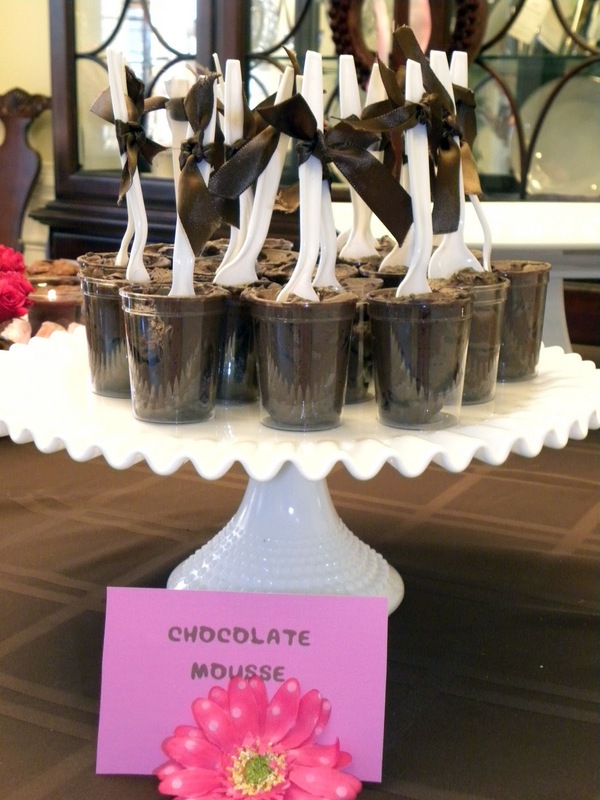 After making the mousse but before chilling in the refrigerator, I spooned the mousse into individual shot glasses. Then I chilled. It made for a great presentation! Recipe below. Sprinkle gelatin over cold water in small bowl; let stand 2 minutes to soften. Add boiling water; stir until gelatin is completely dissolved and mixture is clear. Cool slightly. Combine sugar and cocoa in large bowl; add whipping cream and vanilla. Beat on medium speed of mixer, scraping bottom of bowl occasionally, until mixture is stiff. Pour in gelatin mixture; beat until well blended. Spoon into dessert dishes. Refrigerate at least 30 minutes. Garnish as desired. Store covered in refrigerator. 8 servings. My friend Hillary made the Chocolate Balls. These are EXCELLENT! 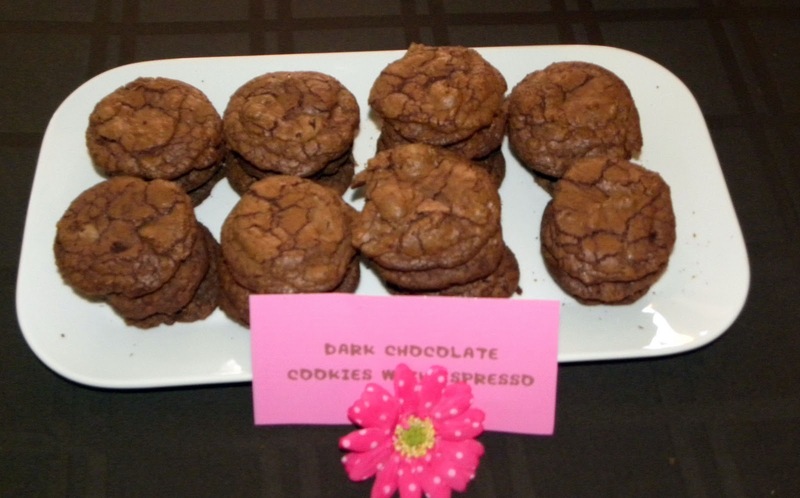 The dark chocolate is very rich and you can taste the coffee flavor. Note about the Espresso Powder - I know there is Espresso Powder, but I can never find it. Whenever a recipe calls for coffee grounds or espresso powder, I use the Starbucks Via packs. It's Starbucks' version of the instant I like to keep those around in case I need coffee on the go - it's actually quite delicious! These are super easy. 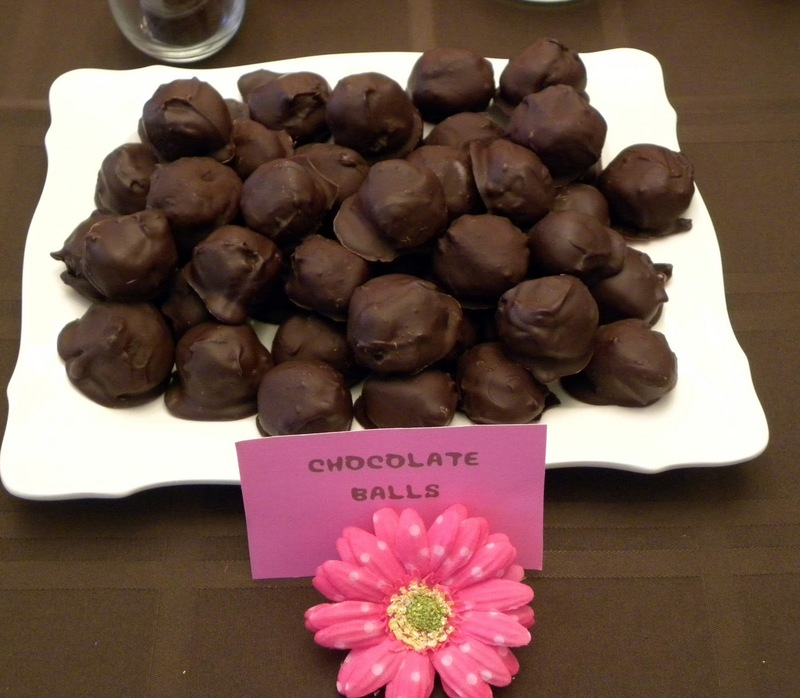 Use chocolate chips or candy melts as the melted chocolate. 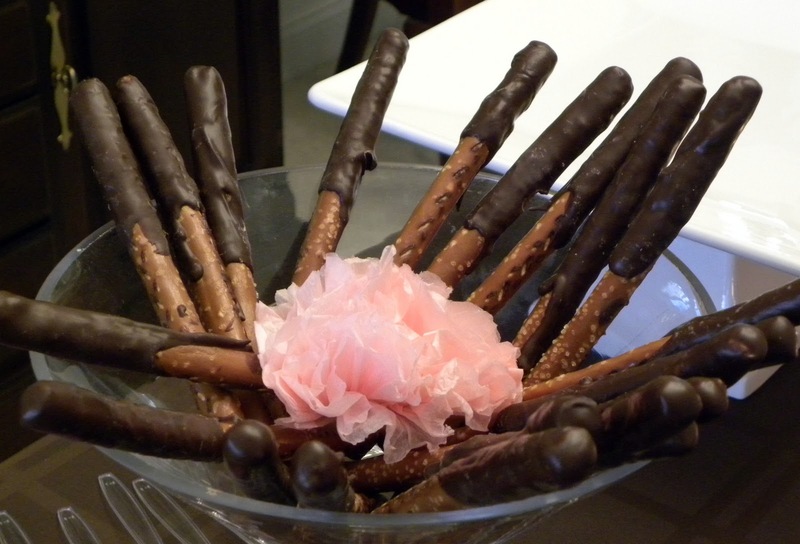 Make sure put the chocolate in a tall glass so you can cover a good portion of the pretzel with chocolate when you dip it. I dried these in short cups with a plate underneath to catch the chocolate drippings. You can even embellish the chocolate with colored sprinkles as long as the chocolate is not dry yet. Salty and Sweet - yum! Preheat the oven to 350 degrees. Butter two 8-inch round cake pans. Line with parchment paper, then butter and flour the pans. add the coffee and stir just to combine, scraping the bottom of the bowl with a rubber spatula. then turn them out onto a cooling rack and cool completely. 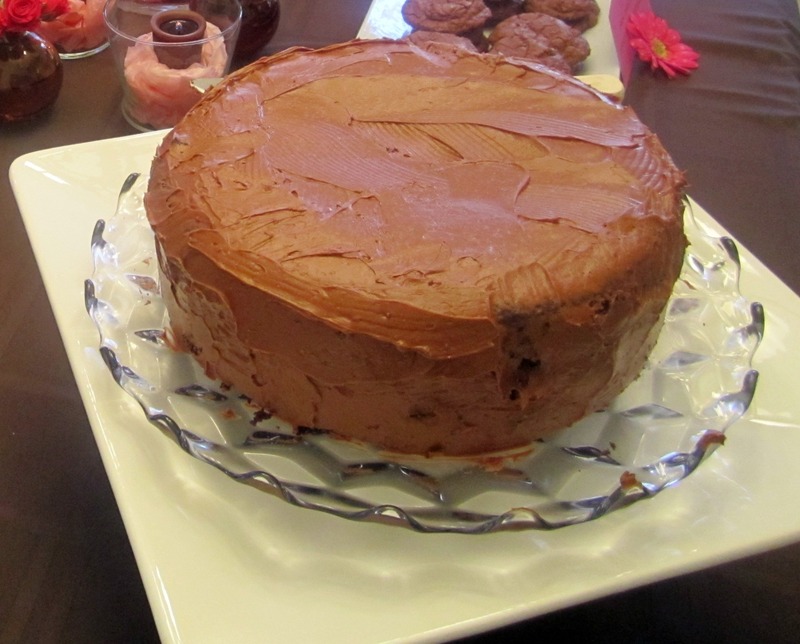 Place one layer, flat side up, on a flat plate or cake pedestal. spread the frosting evenly on the top and sides of the cake. mixture and mix until blended. Don’t whip! Spread immediately on the cooled cake. 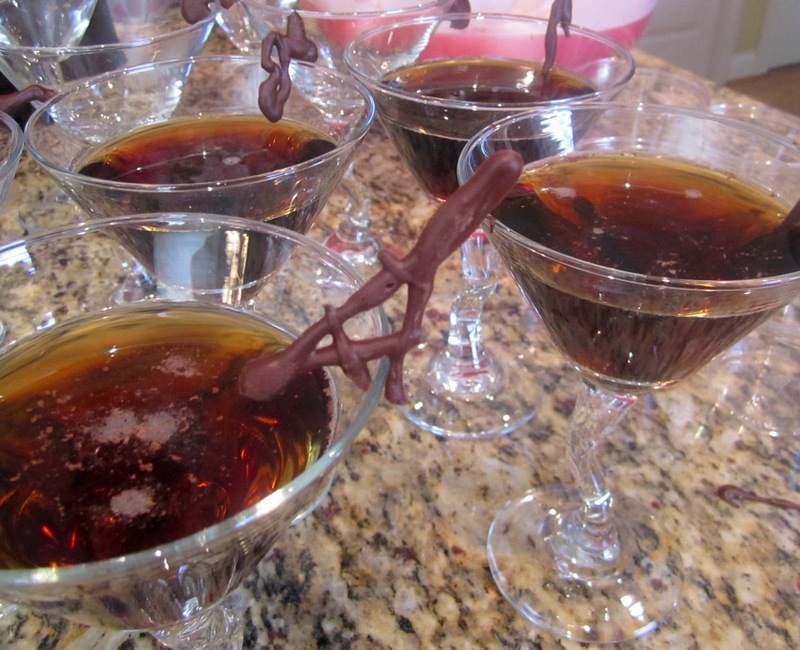 To wash down all these chocolate treats, I made a chocolate cocktail that was quite delicious. It's an Emeril recipe, but I didn't use the walnut liquor. It sounded weird to me! It was fun to make because I got to use my cocktail shaker, which I don't use a lot. More of a wine gal. Whenever I use the shaker, I want to be like Mad Men and have cocktail hour in the afternoons....although I feel like that could bring trouble ha! Combine the vodka and liqueurs in a cocktail shaker with ice, and shake for 30 seconds to combine. Pour into 2 glasses over cracked ice. Top with chocolate, and serve. Well there you have it. Enough chocolate to send you into a sugar coma. Enjoy! i thought beatty's chocolate cake was some secret kunkle family recipe... you said that, didn't you?! Wow! Love all the chocolaty goodness!